Also from Yoda. I would add that fear also leads to paralysis, inaction, and avoiding decisions. Use today to heed the words and wisdom of Yoda. Be the driving force of your own life and do. 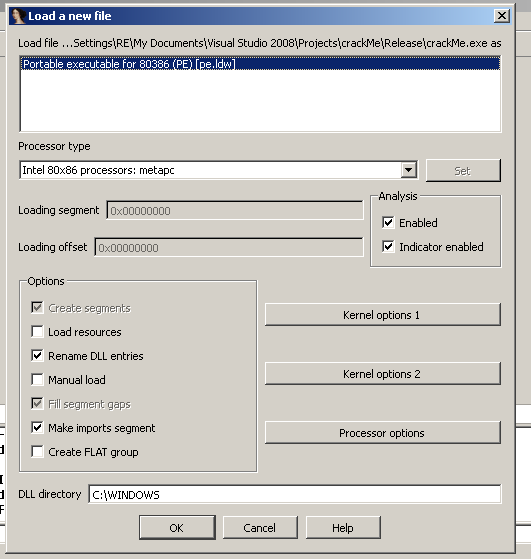 In this post, we will learn how to use the demo version of IDA Pro to disassemble, debug, and crack a simple crackMe software. You may download a copy of crackMe here. 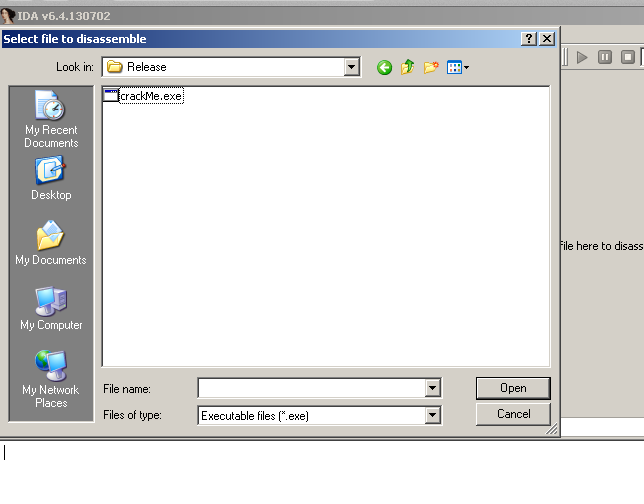 Simply unzip, load into IDA Pro, and follow along. In our scenario, we have a piece of software that is asking for a passphrase or key to unlock it. Since we don’t know the correct passcode, the software exits with a “wrong password” message. All is not lost. This is the power of reverse engineering and using tools such as IDA Pro’s disassembler and debugger: we don’t need the source code to learn how the software works. 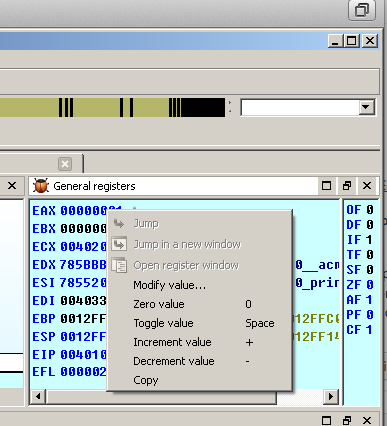 With just a debugger and a disassembler, we can often extract keys and learn a lot about the our target software. At the very top is the navigation band. It gives a layout of the binary as loaded in the virtual address space of memory. The dark blue bands refer to code or functions written inside the binary. The light blue bands refer to functions that come from a library (e.g. the C run time library), and the pink area refers to Windows APIs that are loaded by Dynamic Link Libraries (DLLs). The boxes on the left side contain a function window and a graph overview window. Both can be used to quickly navigate to areas of code that might be interesting to investigate. The middle window contains a call graph of the entire binary. You can change from this call graph view to a flat source code view by hitting the space bar. The space bar will toggle back and forth between call graph view and flat view. 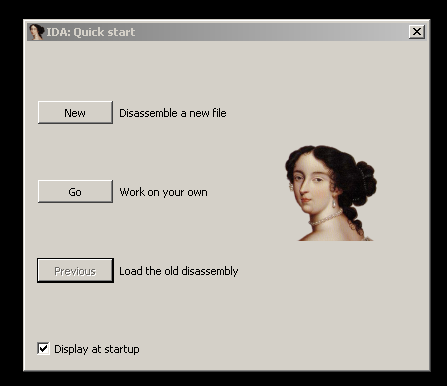 Before examining the source code, let us first set up IDA’s debugger. In the menu bar, select Debugger, then at the dialog box, select the Local Win32 debugger. Once the debugger is set, the green debugging arrow should be activated. Before we begin debugging, lets navigate around the code to find some interesting landmarks. Right at the start, we can see a call being made to a Windows API, IsDebuggerPresent. According to the Microsoft Developers Network documentation, this function determines if the calling process, i.e. 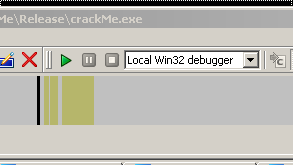 crackMe, is being debugged by a user-mode debugger. It sets EAX to 1 if the calling process is being debugged. It sets EAX to 0 if the calling process is not being debugged. 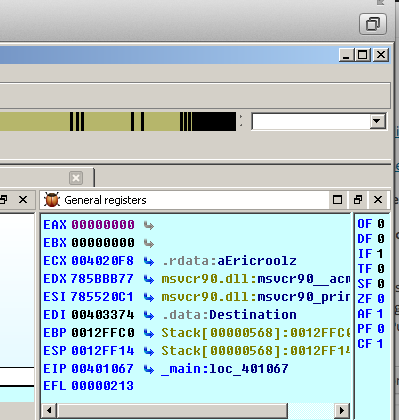 If we were to start the IDA debugger (green arrow button or hit F9 key), crackMe simply exits. So we will have to deal with this common anti-debugging technique. It looks like this comparison routine is comparing the user’s command line input to the hard-coded string “ericroolz”. We are setting the break point in such a way that we are not suspending the program when we hit the break point, but simply setting the return value (stored in EAX) from IsDebuggerPresent to always be 0, that is, regardless of the fact that we are running crackMe in IDA’s debugger, the condition will always return false and we will fool the program into continuing with our debug session. 1. We can change the value of EAX by highlighting the EAX register, right clicking and choosing the “Zero value”. This will change EAX to 0 and we will take the path to the correct password message. 2. We could step past the TEST EAX, EAX instruction and pause on the JNZ instruction. If EAX was 0, the TEST instruction would set the zero flag (ZF = 1) but since what I typed in won’t match “ericroolz” either, the zero flag will not be set (ZF=0). We can simply change the zero flag by right clicking on the ZF value and choosing “Increment value”. This will increment the ZF to 1 from 0, thus causing the JNZ instruction to take the correct password message. Now that we know the crucial decision point, we could use an editor such as OllyDbg and change the JNZ instruction to something that will always jump to the correct message location no matter what passphrase is typed in. 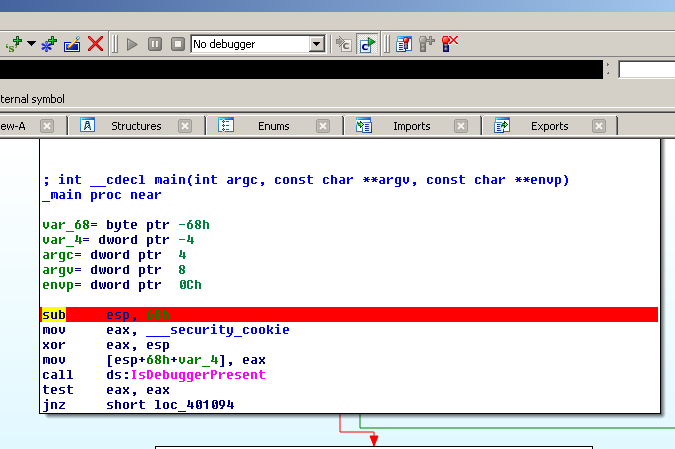 Although, this example was rather simple, it does illustrate the power of using a disassembler and a debugger. Even though we do not possess the source code, that did not prevent us from learning how our target binary worked. Once we understood how our binary worked, we were able to manipulate it into “unlocking” itself.